Our Dental Products help you keep your teeth and gums healthy and clean without harsh chemicals. Did you know that there are many brands of toothpaste that claim to be natural, yet questionable ingredients appear? Our dental products are infused with essential oils and no negative chemistry. Why use natural, pure ingredients in your mouth? The inside of your cheeks is one of the most absorbant places in your body. According to the Physician’s Desk Reference Handbook, the mucosal lining inside your mouth has an absorption efficiency of over 90 percent! Anything used in the mouth is quickly absorbed into the bloodstream. I personally use of all the dental products since they have arrived in the Young Living catalog. I love the fresh and clean taste of Thieves Blend in my mouth. It keeps my breath fresh and tastes wonderful! I encourage you to try them for yourself. Eliminate the toxic chemcals that are included in most commercial toothpastes and mouthwash. Discover the natural alternative to oral health with our essential oil-infused oral care products. Never brush your teeth with sodium laurel sulfate (SLS) and toxic chemicals again! The all-natural ingredients in Thieves® Dentarome Toothpastes ensure superior cleaning and healthy whitening with the power of pure, therapeutic-grade essential oils. preferred by children and those with sensitive gums. KidScents Slique Toothpaste has a flavor most children love and helps fights decay! a smooth texture for a comfortable clean. essential oils to freshen your breath and promote healthy gums. for longer-lasting effects on teeth and gums. inside the mouth for longer-lasting effects on teeth and gums. Young Living Dental Products contain Thieves Blend oil. This taste is very pleasant and fresh. The essence of cinnamon, lemon, and eucalyptus really make your breath smell clean and fresh. What is in Thieves Blend? Thieves essential oil blend is a powerful combination of Clove, Lemon, Cinnamon Bark, Eucalyptus Radiata, and Rosemary essential oils that fills any space with a rich, spicy aroma. This is one of our most popular products. 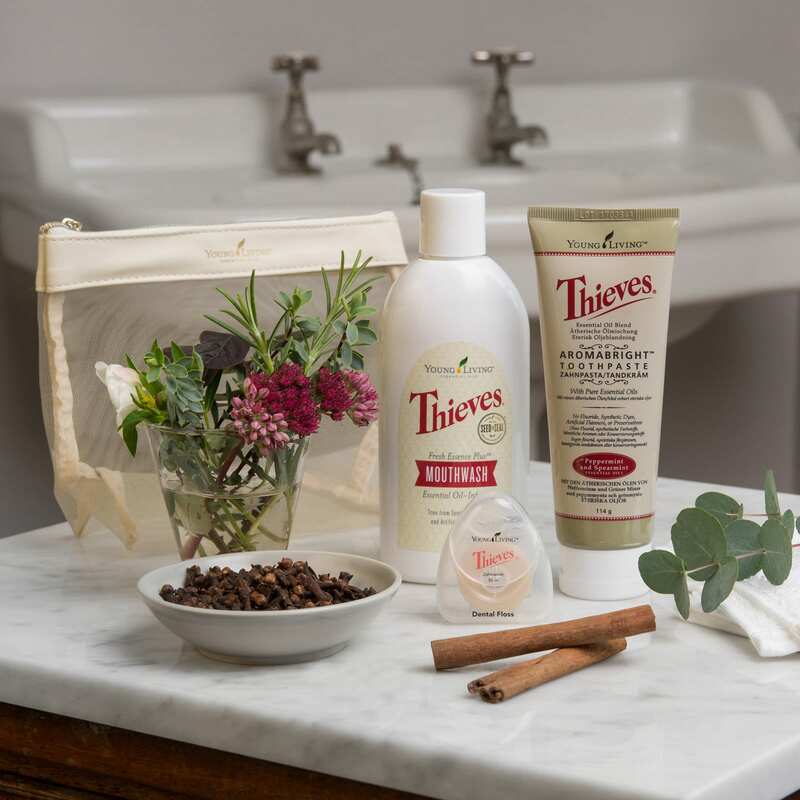 It’s no wonder that Thieves is a key ingredient included in our personal dental care products. Clove was one of the first spices to be traded and can be traced back as far as 1721 BC. It was one of the most precious spices of the 16th and 17th centuries. Eugenol, the main constituent of Clove essential oil, has been heavily researched for its beneficial properties. Eucalyptus Radiata originates in Australia, and there are over 900 different species of eucalyptus. Cinnamon spice has been used for centuries. Rosemary was known by ancient cultures as the herb of memory. Young Living’s Thieves essential oil blend was inspired by the legend of four 15th-century French thieves who formulated and wore a special aromatic combination of clove, rosemary, and other botanicals that they believed provided protection while they were stealing. French authorities recognized that there was such value in this mixture. Upon the thieves’ capture, they received a more merciful punishment on condition that they divulge the ingredients in their secret formula.